Maximum throughput wherever you need it. TP-LINK L2 Managed Switches have robust security and management features. An advanced Access Control List (ACL, L2 to L4) and the TP-LINK strong safeguard provide security coverage from core to edge and protect against broadcast storm, ARP and Denial-of-Service (DoS) attacks, etc. Quality of Service (QoS, L2 to L4) provides enhanced traffic management capabilities to move your data smoother and faster. Plus, the easy-to-use web management interfaces, along with CLI, SNMP and RMON, mean faster setup and configuration for less downtime. Secure networking TP-LINK TL-SL3428 provides IP-MAC-port-VID binding, port security, storm control and DHCP snooping which protect against broadcast storms, ARP attacks, etc. It integrates some typical Dos attacks to select. You can protect these attacks more easily ever than before. In addition, the access control lists feature restricts access to sensitive network resources by denying packets based on source and destination MAC address, IP address, TCP/UDP ports and even VLAN ID. Moreover, the switch supports 802.1X authentication, which is used in conjunction with a RADIUS server to require some authentication information before access to the network is allowed. Guest VLAN function supports to enable the non-802.1X clients to access the specific network resource. Advanced QoS features To integrate voice data and video service on one network, TL-SL3428 applies rich QoS policies. Administrator can designate the priority of the traffic based on a variety of means including IP or MAC address, TCP or UDP port number, etc, to ensure that voice and video are always clear, smooth and jitter free. In conjunction with the voice VLAN the switch supporting, the voice applications will operate with much smoother performance. Abundant layer 2 features For more application of layer 2 switches, TL-SL3428 supports a complete lineup of layer 2 features; including 802.1Q tag VLAN, port isolation, port mirroring, STP/RSTP/MSTP, link aggregation control protocol and 802.3x flow control function. Any more, the switch provides advanced features for network maintenance,. IGMP snooping ensures the switch intelligently forward the multicast stream only to the appropriate subscribers while IGMP throttling and filtering restrict each subscriber on a port level to prevent unauthorized multicast access. Enterprise level management features TL-SL3428 is easy to use and manage. It supports various user-friendly standard management features, such as intuitive web-based Graphical User Interface (GUI) or industry-standard Command Line Interface (CLI), either administration traffic can be protected through SSL or SSH encryptions. SNMP and RMON support enables the switch to be polled for valuable status information and send traps on abnormal events. In addition, integrated NDP/NTDP protocol, the switch supports to be managed by the commander switch through IP clustering function more easily. Designed for workgroups and departments, TL-SL5428E from TP-link provides full set of Layer 2 management features. It delivers maximum throughput where you need it - to high-performance workgroups at the edge of the network, or as a backbone for Fast Ethernet switches and high-speed servers in demanding small networks. Moreover, TL-SL5428E switch also comes equipped with 2 combo SFP slots, giving you greater network flexibility.This TP-link L2 managed switch has robust security and management features. For workgroup and departments requiring cost-sensitive Layer 2 switch, and additional Gigabit capability, TP-link L2 fully managed switch TL-SL5428E can provide you the ideal access-edge solution. 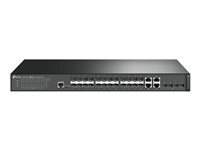 Abundant L2 Features T2500G-10TS supports a complete lineup of L2 features, including 802.1Q VLAN, QinQ, Port Mirroring, STP/RSTP/MSTP, Link Aggregation Control Protocol and 802.3x Flow Control function. In addition, the switch provides advanced features for network maintenance, including LoopBack Detection and Cable Diagnostics. IGMP Snooping ensures intelligent forwarding of the multicast stream to only the appropriate subscribers, while IGMP throttling & filtering restricts each subscriber on a port level to prevent unauthorised multicast access. Secure Networking The T2500G-10TS provides IP-MAC-Port Binding, Port Security, Storm control and DHCP Snooping which protect against broadcast storms, ARP attacks, etc. It integrates some typical DoS attacks to select. You can protect these attacks more easily ever than before. In addition, the Access Control Lists (ACL, L2 to L4) feature restricts access to sensitive network resources by denying packets based on source and destination MAC address, IP address, TCP/UDP ports and even VLAN ID. Moreover, the switch supports 802.1X authentication, which is used in conjunction with a RADIUS server to require some authentication information before access to the network is allowed. Guest VLAN function supports to enable the non-802.1X clients to access the specific network resource. Advanced QoS Features To integrate voice, data and video service on one network, T2500G-10TS supports rich QoS policies. Administrator can designate the priority of the traffic based on a variety of means including Port Priority, 802.1p Priority and DSCP Priority, to ensure that voice and video are always clear, smooth and jitter free. In conjunction with the Voice VLAN the switch supports, the voice applications will operate with much smoother performance. Enterprise Level Management Features T2500G-10TS is easy to use and manage. It supports various user-friendly standard management features, such as intuitive web-based Graphical User Interface (GUI) or industry-standard Command Line Interface (CLI), either administration traffic can be protected through SSL or SSH encryptions. SNMP (v1/v2c/v3) and RMON support enables the switch to be polled for valuable status information and send traps on abnormal events. And it also supports Dual Image, which provides reduced down-time for the switches, when the image is being upgraded / downgraded. Secure networking The T2600G-18TS provides IP-MAC-Port Binding, Port Security, Storm control and DHCP Snooping which protect against broadcast storms, ARP attacks, etc. It integrates some typical Dos attacks to select. You can protect these attacks more easily ever than before. In addition, the Access Control Lists (ACL, L2 to L4) feature restricts access to sensitive network resources by denying packets based on source and destination MAC address, IP address, TCP/UDP ports and even VLAN ID. Moreover, the switch supports 802.1X authentication, which is used in conjunction with a RADIUS server to require some authentication information before access to the network is allowed. Guest VLAN function supports to enable the non-802.1X clients to access the specific network resource. Abundant L2 and L2+ features T2600G-18TS supports a complete lineup of L2 features, including 802.1Q tag VLAN, Port Mirroring, STP/RSTP/MSTP, Link Aggregation Control Protocol and 802.3x Flow Control function. Any more, the switch provides advanced features for network maintenance. Such as Loopback Detection, Cable Diagnostics and IGMP Snooping. IGMP snooping ensures the switch intelligently forward the multicast stream only to the appropriate subscribers while IGMP throttling & filtering restrict each subscriber on a port level to prevent unauthorized multicast access. Moreover, T2600G-18TS supports L2+ feature - static routing, which is a simple way to provide segmentation of the network with internal routing through the switch and helps network traffic for more efficient use. IPv6 support T2600G-18TS supports various IPv6 functions such as Dual IPv4/IPv6 Stack, MLD Snooping, IPv6 ACL, DHCPv6 Snooping, IPv6 Interface, Path Maximum Transmission Unit (PMTU) Discovery and IPv6 Neighbor Discovery, which guarantees your network is ready for the Next Generation Network (NGN) without upgrading your network equipment. DDM The T2600G-18TS provides DDM (Digital Diagnostic Monitoring) function to view the status of SFP modules inserting to the Switch and to configure alarm settings, warning settings, temperature threshold settings, voltage threshold settings, bias current threshold settings, TX power threshold settings, and Rx power threshold settings.Enterprise Level Management FeaturesT2600G-18TS is easy to use and manage. It supports various user-friendly standard management features, such as intuitive web-based Graphical User Interface (GUI) or industry-standard Command Line Interface (CLI), either administration traffic can be protected through SSL or SSH encryptions. SNMP (v1/v2c/v3) and RMON support enables the switch to be polled for valuable status information and send traps on abnormal events. Secure networking TP-LINK JetStream L2 managed switch T2600G-28TS provides IP-MAC-Port Binding, Port Security, Storm control and DHCP Snooping which protect against broadcast storms, ARP attacks, etc. It integrates some typical Dos attacks to select. You can protect these attacks more easily ever than before. In addition, the Access Control Lists (ACL, L2 to L4) feature restricts access to sensitive network resources by denying packets based on source and destination MAC address, IP address, TCP/UDP ports and even VLAN ID. Moreover, the switch supports 802.1X authentication, which is used in conjunction with a RADIUS server to require some authentication information before access to the network is allowed. Guest VLAN function supports to enable the non-802.1X clients to access the specific network resource. Advanced QoS features To integrate voice, data and video service on one traffic based on a variety of means including IP or MAC address, TCP or UDP port number, etc, to ensure that voice and video are always clear, smooth and jitter free. In conjunction with the Voice VLAN the switch supporting, the voice applications will operate with much smoother performance. Abundant L2 and L2+ features T2600G-28TS supports a complete lineup of L2 features, including 802.1Q tag VLAN, Port Mirroring, STP/RSTP/MSTP, Link Aggregation Control Protocol and 802.3x Flow Control function. Any more, the switch provides advanced features for network maintenance. Such as Loop Back Detection, Cable Diagnostics and IGMP Snooping. IGMP snooping ensures the switch intelligently forward the multicast stream only to the appropriate subscribers while IGMP throttling & filtering restrict each subscriber on a port level to prevent unauthorized multicast access. Moreover, T2600G-28TS supports L2+ feature - static routing, which is a simple way to provide segmentation of the network with internal routing through the switch and helps network traffic for more efficient use. IPv6 Support T2600G-28TS supports various IPv6 functions such as Dual IPv4/IPv6 Stack, MLD Snooping, IPv6 ACL, DHCPv6 Snooping, IPv6 Interface, Path Maximum Transmission Unit (PMTU) Discovery and IPv6 Neighbor Discovery, which guarantees your network is ready for the Next Generation Network (NGN) without upgrading your network equipment. OAM The T2600G-52TS provide 802.3ah OAM and Device Link Detection Protocol (DLDP) functions improving monitor and troubleshoot Ethernet networks, help facilitate network management. Enterprise level management features T2600G-28TS is easy to use and manage. It supports various user-friendly standard management features, such as intuitive web-based Graphical User Interface (GUI) or industry-standard Command Line Interface (CLI), either administration traffic can be protected through SSL or SSH encryptions. SNMP (v1/v2c/v3) and RMON support enables the switch to be polled for valuable status information and send traps on abnormal events. 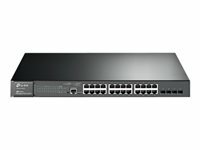 Secure networking TP-LINK JetStream L2 managed switch T2600G-52TS provides IP-MAC-Port Binding, Port Security, Storm control and DHCP Snooping which protect against broadcast storms, ARP attacks, etc. It integrates some typical Dos attacks to select. You can protect these attacks more easily ever than before. In addition, the Access Control Lists (ACL, L2 to L4) feature restricts access to sensitive network resources by denying packets based on source and destination MAC address, IP address, TCP/UDP ports and even VLAN ID. Moreover, the switch supports 802.1X authentication, which is used in conjunction with a RADIUS server to require some authentication information before access to the network is allowed. Guest VLAN function supports to enable the non-802.1X clients to access the specific network resource. 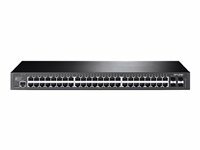 Abundant L2 and L2+ features T2600G-52TS supports a complete lineup of L2 features, including 802.1Q tag VLAN, Port Mirroring, STP/RSTP/MSTP, Link Aggregation Control Protocol and 802.3x Flow Control function. Any more, the switch provides advanced features for network maintenance, such as Cable Diagnostics and IGMP Snooping. IGMP snooping ensures the switch intelligently forward the multicast stream only to the appropriate subscribers while IGMP throttling & filtering restrict each subscriber on a port level to prevent unauthorized multicast access. Moreover, T2600G-52TS supports L2+ feature - static routing, which is a simple way to provide segmentation of the network with internal routing through the switch and helps network traffic for more efficient use. IPv6 support T2600G-52TS supports various IPv6 functions such as Dual IPv4/IPv6 Stack, MLD Snooping, IPv6 ACL, DHCPv6 Snooping, IPv6 Interface, Path Maximum Transmission Unit (PMTU) Discovery and IPv6 Neighbor Discovery, which guarantees your network is ready for the Next Generation Network (NGN) without upgrading your network equipment. Enterprise level management features T2600G-52TS is easy to use and manage. It supports various user-friendly standard management features, such as intuitive web-based Graphical User Interface (GUI) or industry-standard Command Line Interface (CLI), either administration traffic can be protected through SSL or SSH encryptions. SNMP (v1/2/3) and RMON support enables the switch to be polled for valuable status information and send traps on abnormal events. And it also supports Dual Image，which provides reduced down-time for the switches. IEEE 802.3at/af-compliant Power over Ethernet The T2600G-28MPS supports 24 ports of IEEE 802.3at/af-compliant PoE and has a total power supply of 384W to power any 802.3at or 802.3af compliant power device. It's an efficient and cost-effective choice to work with wireless access points, surveillance cameras, IP phones and other PoE supported devices, while getting rid of cables or power lines running around. Compact and flexible, the T2600G-28MPS is ideal to flexibly use PoE to deploy wireless access points or IP-based network surveillance cameras for projects or small business networks. Secure networking The T2600G-28MPS provides IP-MAC-Port Binding, Port Security, Storm control and DHCP Snooping which protect against broadcast storms, ARP attacks, etc. It integrates some typical DoS attacks to select. You can protect these attacks more easily ever than before. In addition, the Access Control Lists (ACL, L2 to L4) feature restricts access to sensitive network resources by denying packets based on source and destination MAC address, IP address, TCP/UDP ports and even VLAN ID. Moreover, the switch supports 802.1X authentication, which is used in conjunction with a RADIUS server to require some authentication information before access to the network is allowed. Guest VLAN function supports to enable the non-802.1X clients to access the specific network resource. Secure networking The T2600G-28SQ provides IP-MAC-Port Binding, Port Security, Storm control and DHCP Snooping which protect against broadcast storms, ARP attacks, etc. It integrates some typical Dos attacks to select. You can protect these attacks more easily ever than before. In addition, the Access Control Lists (ACL, L2 to L4) feature restricts access to sensitive network resources by denying packets based on source and destination MAC address, IP address, TCP/UDP ports and even VLAN ID. Moreover, the switch supports 802.1X authentication, which is used in conjunction with a RADIUS/Tacacs+ server to require some authentication information before access to the network is allowed. Abundant L2 and L2+ features T2600G-28SQ supports a complete lineup of L2 features, including 802.1Q VLAN, Port Mirroring, STP/RSTP/MSTP, Link Aggregation Control Protocol and 802.3x Flow Control function. Any more, the switch provides advanced features for network maintenance. Such as Loopback Detection, Cable Diagnostics and IGMP Snooping. IGMP snooping ensures the switch intelligently forward the multicast stream only to the appropriate subscribers while IGMP throttling & filtering restrict each subscriber on a port level to prevent unauthorized multicast access. Moreover, T2600G-28SQ supports L2+ feature-static routing, which is a simple way to provide segmentation of the network with internal routing through the switch and helps network traffic for more efficient use. ISP features T2600G-28SQ supports a bundle of ISP features such as 802.3ah OAM, DDM, sFlow, QinQ, L2PT PPPoE ID Insertion, IGMP authentication etc. 802.3ah OAM and Device Link Detection Protocol (DLDP) functions improve monitor and troubleshoot Ethernet networks, help facilitate network management. DDM(Digital Diagnostic Monitoring) function helps view the status of SFP modules inserting to the Switch and to configure alarm settings, warning settings, temperature threshold settings, voltage threshold settings, bias current threshold settings, TX power threshold settings, and RX power threshold settings. IPv6 support T2600G-28SQ series support various IPv6 functions such as Dual IPv4/IPv6 Stack, MLD Snooping, IPv6 ACL, DHCPv6 Snooping, IPv6 Interface, Path Maximum Transmission Unit (PMTU) Discovery and IPv6 Neighbor Discovery, which guarantees your network is ready for the Next Generation Network (NGN) without upgrading your network equipment. Enterprise level management features T2600G-28SQ is easy to use and manage. It supports various user-friendly standard management features, such as intuitive web-based Graphical User Interface (GUI) or industry-standard Command Line Interface (CLI), either administration traffic can be protected through SSL or SSH encryptions. SNMP (v1/v2c/v3) and RMON support enables the switch to be polled for valuable status information and send traps on abnormal events.